Nutmeg Afghan Hound Club, Inc. The Afghan Hound is an aristocrat, his whole appearance one of dignity and aloofness with no trace of plainness or coarseness. He has a straight front, proudly carried head, eyes gazing into the distance as if in memory of ages past. 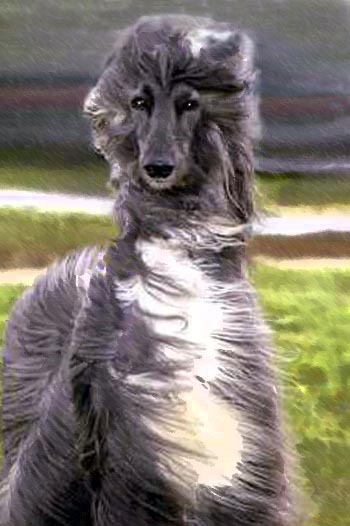 The striking characteristics of the breed-exotic, or "Eastern," expression, long silky topknot, peculiar coat pattern, very prominent hipbones, large feet, and the impression of a somewhat exaggerated bend in the stifle due to profuse trouserings-stand out clearly, giving the Afghan Hound the appearance of what he is, a king of dogs, that has held true to tradition - out the ages. The head is of good length, showing much refinement, the skull evenly balanced with the foreface. There is a slight prominence of the nasal bone structure causing a slightly Roman appearance, the center line running up over the foreface with little or no stop, falling away in front of the eyes so there is an absolutely clear outlook with no interference; the underjaw showing great strength, the jaws long and punishing; the mouth level, meaning that the teeth from the upper jaw and lower jaw match evenly, neither overshot nor undershot. This is a difficult mouth to breed. A scissors bite is even more punishing and can be more easily bred into a dog than a level mouth, and a dog having a scissors bite, where the lower teeth slip inside and rest against the teeth of the upper jaw, should not be penalized. The occipital bone is very prominent. The head is surmounted by a topknot of long silky hair. Ears--The ears are long, set approximately on level with outer corners of the eyes, the leather of the ear reaching nearly to the end of the dog's nose, and covered with long silky hair. Eyes--The eyes are almond-shaped (almost triangular), never full or bulgy, and are dark in color. Nose--Nose is of good size, black in color. Faults-- Coarseness; snippiness; overshot or undershot; eyes round or bulgy or light in color; exaggerated Roman nose; head not surmounted with topknot. The neck is of good length, strong and arched, running in a curve to the shoulders which are long and sloping and well laid back. Faults--Neck too short or too thick; a ewe neck; a goose neck; a neck lacking in substance. The back line appearing practically level from the shoulders to the loin. Strong and powerful loin and slightly arched, falling away toward the stern, with the hipbones very pronounced; well ribbed and tucked up in flanks. The height at the shoulders equals the distance from the chest to the buttocks; the brisket well let down, and of medium width. Faults--Roach back, swayback, goose rump, slack loin; lack of prominence of hipbones; too much width of brisket, causing interference with elbows. Forelegs are straight and strong with great length between elbow and pastern; elbows well held in; forefeet large in both length and width; toes well arched; feet covered with long thick hair; fine in texture; pasterns long and straight; pads of feet unusually large and well down on the ground. Shoulders have plenty of angulation so that the legs are well set underneath the dog. Too much straightness of shoulder causes the dog to break down in the pasterns, and this is a serious fault. All four feet of the Afghan Hound are in line with the body, turning neither in nor out. The hind feet are broad and of good length; the toes arched, and covered with long thick hair; hindquarters powerful and well muscled, with great length between hip and hock; hocks are well let down; good angulation of both stifle and hock; slightly bowed from hock to crotch. Faults--Front or back feet thrown outward or inward; pads of feet not thick enough; or feet too small; or any other evidence of weakness in feet; weak or broken down pasterns; too straight in stifle; too long in hock. Hindquarters, flanks, ribs, forequarters, and legs well covered with thick, silky hair, very fine in texture; ears and all four feet well feathered; from in front of the shoulders; and also backwards from the shoulders along the saddle from the flanks and the ribs upwards, the hair is short and close, forming a smooth back in mature dogs - this is a traditional characteristic of the Afghan Hound. The Afghan Hound should be shown in its natural state; the coat is not clipped or trimmed; the head is surmounted (in the full sense of the word) with a topknot of long, silky hair - that is also an outstanding characteristic of the Afghan Hound. Showing of short hair on cuffs on either front or back legs is permissible. Fault--Lack of shorthaired saddle in mature dogs. Aloof and dignified, yet gay.